The ELC-309 is a self-contained control unit designed to allow standard lighting control devices to control the emergency lighting in conjunction with normal lighting in any area within a commercial or industrial building. 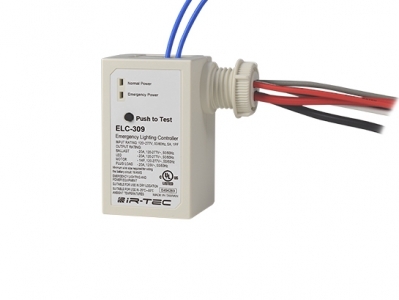 With an occupancy sensor connected, the ELC-309 allows the emergency lighting to be controlled as sensor set mode when normal power is available. Once normal power is unavailable, the emergency lighting will stay on using the emergency power. This control unit can be attached to the existing junction box with 1/2” knockout or mounted into fixture cable trays.